Look It's Megryansmom: Happy 100th Birthday Chevy! Chevrolet Motor Co., was launched on Nov 3, 1911, in Detroit when Louis Chevrolet, a Swiss-born race car driver and engineer, joined William Durant to start a new brand. And the rest as they say, is history. Chevy has been a part of my life forever. We're a Chevy family! Daddy drove the three of us home from the hospital in a shiny black 1962 Chevy Impala. I learned to drive in a silver 1977 Chevy Impala. I made out in the back seat of a 1969 Chevelle and a 1977 brand spanking new Chevy Camaro. Daddy traded the 77 Impala for a Corsica and then for a Cavalier. In 1988, I was driving a new Eurosport station wagon. Then came a Eurosport sedan, followed by an S-10 pickup and a red Monte Carlo in 1999 that was Ryan's 1st new to him car when Whynot traded for a 2002 Monte Carlo. In 2006, Glitter Gurl purchased her 1st car, a brand new purple Cobalt that she still drives. In 2008, Whynot made the change to a 4 door car to accommodate car seats and if you guessed another Chevy you are correct. 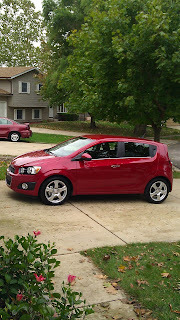 When my friends at GM asked if I'd like to test drive a new 2012 Chevy Sonic there was no twisting my arm. I knew it was a brand I could trust, it would be fun zipping around town in, and my neighbors would be green with envy LOL. Since I usually pick my cars based on how pretty they look I'm going to share some information provided by Chevy. 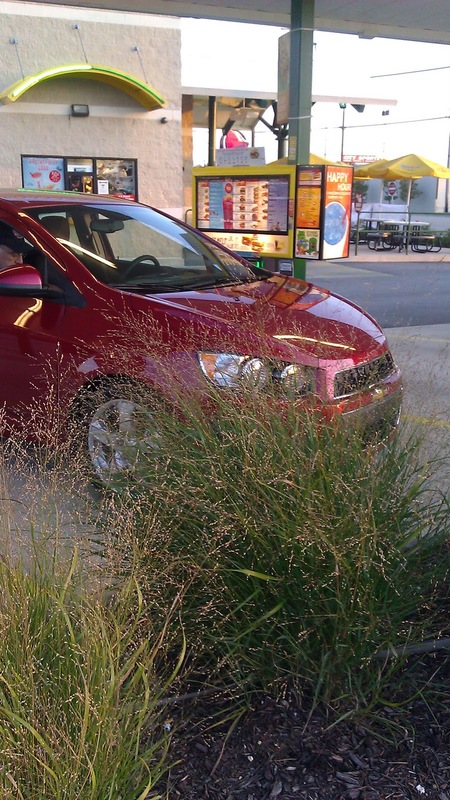 The Sonic is Chevrolet's newest small car. It was developed to be fun to drive. Oh yes it was! Fun to drive that is. It blends the affordability and practicality of a small car with athletic and agile performance. I think that means it handles well. The Sonic is a safer small car with class-leading 10 standard air bags. It comes in 2 body styles, a sedan and a hatchback and has 3 trim levels LS, LT and LTZ. Prices start as low as $14,495 and it gets really good gas mileage 26/35. I could give you more facts, but quite frankly 1.8 litre and 1.4 litre, and stuff like torque just take away from the pretty of the car for me. You gear heads can find all that stuff over here. Now, on to the pretty. They sent me a red hatchback, but not just any red. Chevy calls it Crystal Red Metallic, but you may know it better as I'm Not Really a Waitress. I know that because it's my favorite nail polish color and the color of my current car. 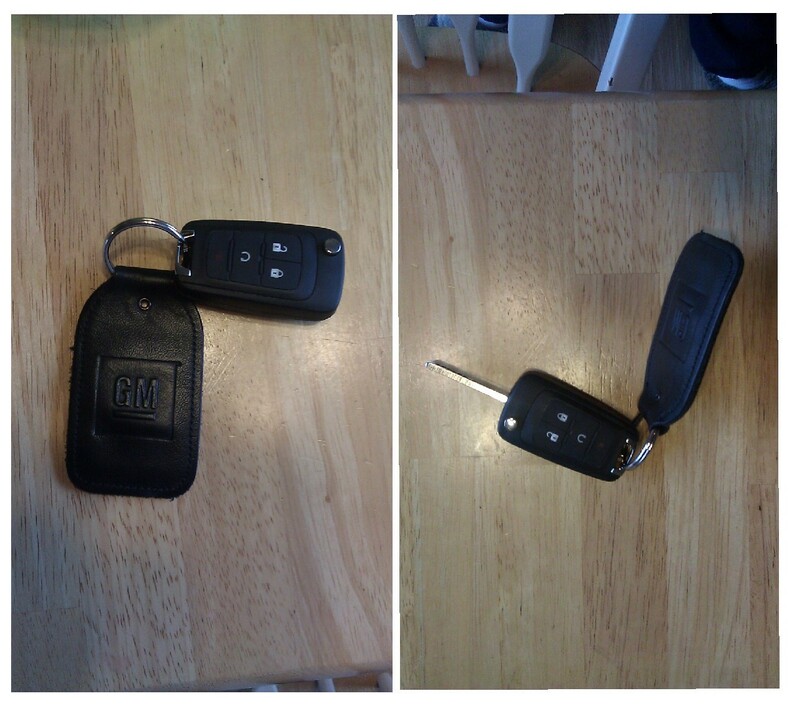 And handed me the key. It was so James Bond-ish to me. Like a switchblade. I thought it would be super clever to take the Sonic to Sonic. But at my Sonic it's hard to get a picture that includes the sign, so you sort of have to squint to see Sonic on the umbrellas in the background. 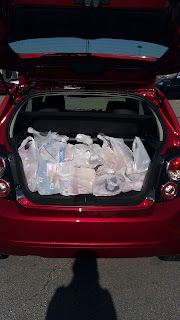 We also drove the Sonic to the grocery store and surprisingly the cargo space was very roomy for a small car. TOF also noted that if you went to the tool store and bought a big piece of wood, the seats folded down so the wood would fit inside. That boy is a smart one. 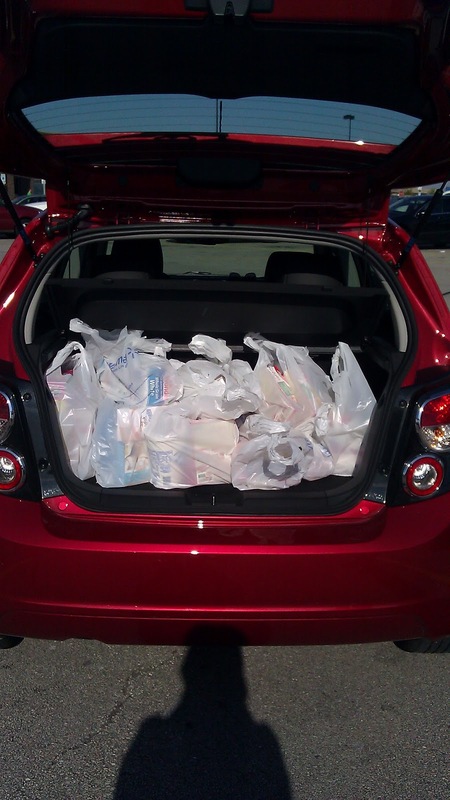 That's $127 worth of groceries! We took it out on the Interstate and according to Whynot and Augie Dawgs, who both know way more about cars than I do, it did indeed handle very well for a small car. I would like to stress that it is small, a sub-compact. I'm fairly tall, 5'7" and I was comfortable driving it and sitting as a passenger. Whynot at 6', although he didn't say it, didn't look as comfortable. In my opinion, this would be the perfect car for a young girl, or as a second car. TOF's car seat fit well in the back seat so even a mom with one child or a grandma like me. It's definitely super cute and an awesome addition from Chevy as they celebrate their centennial. 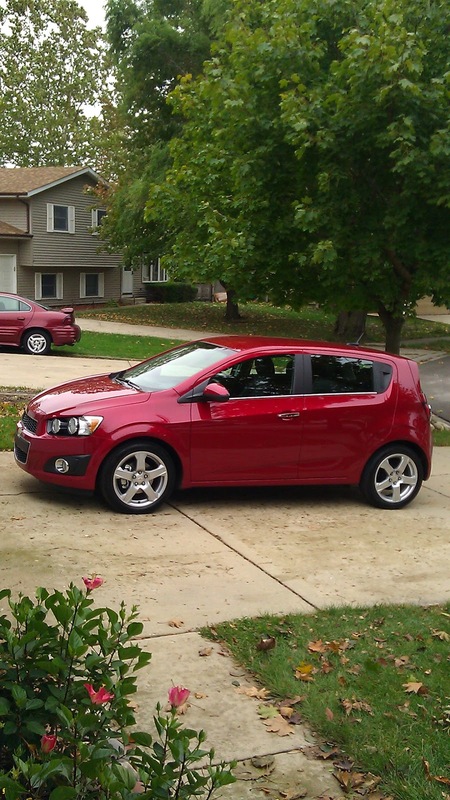 Disclaimer: GM loaned me a Chevy Sonic, with a full tank of gas, for one week. I was not asked to write about my experience. All opinions are my own. Thanks so much for your loyalty, your business and perhaps most of all, for sharing this history in an awesome review. I love reading about the personal, emotional connections to our hunks of metal. It DOES happen. And it can make one rather schweddy. That is such a cutie pie car! Love the paint finish, and I'm short so I'd fit in there perfectly. A Chevy was the first car I bought with my own money.